Always send your full name and address. No questions will be answered when this has been neglected. Only your initials or a chosen nom de plume will be printed. Make your questions short and to the point. Questions regarding particular pieces, metronomic markings, etc., not likely to be of interest to the greater number of Etude readers will not be considered. 1. What does 8 under a note in the bass clef mean? Usually it means with the octave below. 2. Are compositions ever written with both sharps and flats in the same signature? Not in our scale system, but in other scales it is perfectly possible. Thus it occurs in Byzantine music. The Byzantine scale has intervals like our harmonic minor scale, with the fourth note sharp instead of natural. The Byzantine scale corresponding to our D minor would have G-sharp, B- flat, and C-sharp in the signature. 3. Is the first note of a phrase always accented? No. A phrase may begin in any part of a measure. But even if the accent does not fall upon the first note, it should be played clearly, and separated from whatever precedes it. If all are singing in the same composition, with accompaniment of instruments or even without it, the interval would always sound a fifth. It would never sound a fourth unless the tenor or baritone were singing in a different system of pitch from the soprano. The voice is not treated as a transposing instrument, and the singers must not, therefore, sing a tone higher than the note is written. But we do not call a pen a pin, nor do we pronounce been like Ben. I should always prefer the short “i” in “wind” or “windy” unless it disturbed a rhyme. G-C-D-A would be a 5-4-2 chord, as suggested. 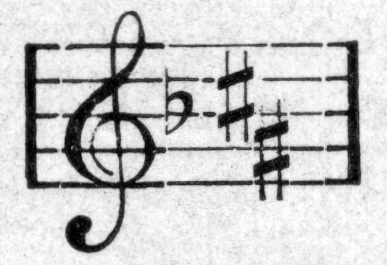 In close position, the A would come after the G. There are four inversions of the chord of the ninth, sometimes called the first, second, third, and fourth inversions, and sometimes called the b, c, d, and e positions, the chord itself being the a position. Your ninth chord is correctly named. From C to G-double-flat, or C-sharp to G-flat, is called a doubly diminished fifth. The half-step is the smallest interval used in our music, but in India the natives use third- and quarter-tones in their music. The A is tied to the half-note, just as the F is, in the second measure. The name of the piece is pronounced Troy-myrrh-eye, with the accent on the last syllable. A. The nail-violin was invented in 1740 by Johann Wilde, a German, living in St. Petersburg. The idea came to him through his accidentally scraping a bow on a metal peg and producing a tone. The nails are placed around the curve of a wooden sounding-board shaped like a half-moon. The shorter nails give higher tones, and those for chromatic intervals are bent slightly. The instrument is played with a strong, well- rosined, black-haired bow. In 1780 sympathetic strings were added. In 1791 an oblong- shaped “nagelclavier” was made by Trager, of Bamberg. This was played by a band coated with rosin and worked by keys. A. The oratorio came almost directly from the miracle play. The earliest miracle play of which we have authentic records is the “Festum Asinorum,” celebrated at Beauvais and Sens in the twelfth century. Fitz Stephen mentions a monk of Canterbury who wrote miracle plays during the reign of Henry II, and died in 1191. In later times “Il Conversione di San Paolo” was sung at Rome in 1440, and “Abram et Isaac suo Figluolo” at Florence in 1449. Over a century later St. Philip Neri, in Rome, had sacred music scenes or plays given in connection with his discourses. As they were given first in the oratory of his new church (Santa Maria, in Vallicella), they were called oratorios, and that name soon became the accepted term for sacred musical dramas. Emilio del Cavalieri is called the founder of modern oratorio, because his “Rappresentazione dell’ Anima e del Corpo” (Rome, 1600) was the first sacred work in the monodic style which Peri and Caccini introduced in opera. All preceding oratorios belonged to the contrapuntal schools. A. If this question were put to the pianists probably a different answer would come from each one. Thus, in ancient Athens, when the leaders were choosing a commander to proceed against the Persians, each one voted for himself; but, as almost all voted for Themistocles as second choice, he was declared elected. Critics are fairly well united in considering Paderewski the greatest living pianist. There are some who excel him in certain special lines—De Pachmann, for instance, in the smaller Chopin works ; D’Albert in Beethoven playing, or Busoni in Bach. But Paderewski is thoroughly versatile, being great in every style and school, and very little behind any of the others, even in their own specialties. But it is as dangerous to choose the “greatest living pianist” as to pick out the most beautiful infant in a baby show. A. Oratorio really preceded opera. Opera resulted from the efforts of a group of Florentine amateurs (the “Camerati”) to revive something like the ancient Greek drama. The foremost of these were Peri and Caccini. Peri’s. “Dafne” was brought out probably in 1594, but was lost, so that his “Euridice” (1600) is considered the first opera. Oratorio was at first acted and sung in costume, and it is quite possible that it influenced the early operas, although we have no absolute proof of this. A. Yes; the Apollo Club of Boston or Chicago, for instance. The English lay great stress on their festival choruses, but the Mænnerchor of Germany deserves recognition for its heartiness and sincerity, even if sometimes lacking in polish. A. The bugle is really prehistoric, for bronze trumpets of the Bronze Age have been discovered. In ancient Jerusalem the ram’s horn was used. In Roman times the war trumpet was called Buccina. A. Lootens gives a description of a Dutch organ, with pedals, said to have been built at Utrecht in 1120. But pedals remained in a rather primitive state until the improvements of the fifteenth century. A. Probably the best set of chimes in this country is the one at the Christian Science church in Boston. The bells are tubular in shape, and are played by a keyboard with electrical connections. They have proven so effective that several duplicate sets have been ordered for other places. A. In the French system of solfeggio, the syllables do, re, mi, etc., are not changed for accidentals. In instrumental music, double sharp is double dieze, and double flat is double bemol. You are reading Answers To Questions from the August, 1910 issue of The Etude Magazine. Useful Recital Music is the next entry in The Etude.